The location is great. There’s a 24 security and the main door opens with an electronic fob. 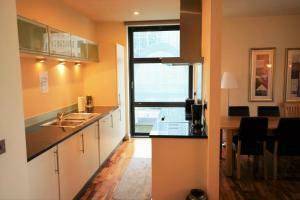 The apartment was very spacious and very well located near the DLR (South Quay) station. All the kitchen amenities were working well. location good. views nice but looks out across a noisy building site. The welcome and check-in was very friendly and efficient. Location is great if you're working in Docklands and is only 3 mins walk from the DLR station so you can be in the City in 15 mins. Location as in Canary wharf is fine but not the location of the apartment which faces tug boats and cranes. Zen Apartments- Canary Wharf This rating is a reflection of how the property compares to the industry standard when it comes to price, facilities and services available. It's based on a self-evaluation by the property. Use this rating to help choose your stay! Zen Apartments Discovery Dock offers luxury apartments in the heart of Canary Wharf. It features apartments with a balcony and wharf or river views. Looking onto the Wharf’s impressive skyscrapers, each apartment at Zen Apartments Discovery Dock has contemporary décor. The spacious lounge has a flat-screen TV and a sofa. The kitchen comes with a microwave, fridge, coffee maker, oven, washing machine and a dishwasher. Free Wi-Fi is included. Shops, bars, cafes and restaurants can be found around Canary Wharf. Canary Wharf Tube Station and the DLR Railway are within a short walk and connect you to central London in approximately 20 minutes. The O2 Arena and Excel can be reached in less than 20 minutes by Tube or the DLR. Private parking is available on site for a surcharge. When would you like to stay at Zen Apartments- Canary Wharf? 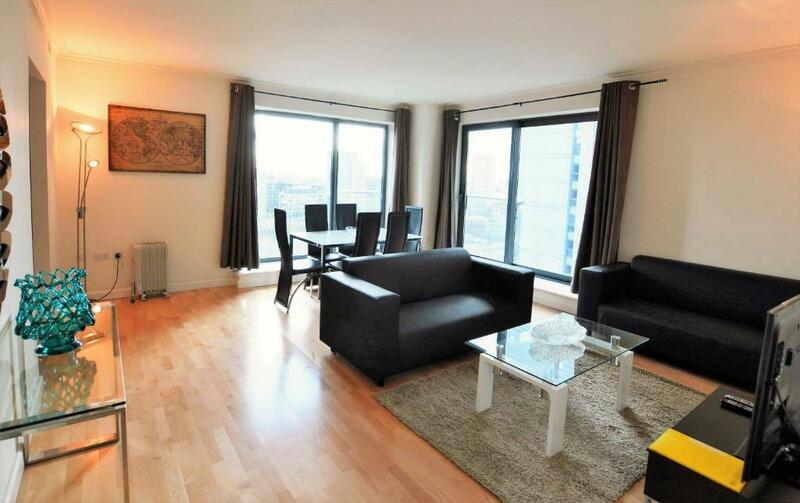 This spacious apartment opens onto a balcony with side views of Canary Wharf's docks and/or City of London. This luxury apartment has contemporary décor, and a spacious lounge with a flat-screen TV with satellite channels and DVD player and comfortable sofas. The open plan kitchen comes with a microwave, fridge, coffee maker, oven, washing machine and a dishwasher. Free Wi-Fi is included. There are 2 bedrooms and 2 bathrooms. 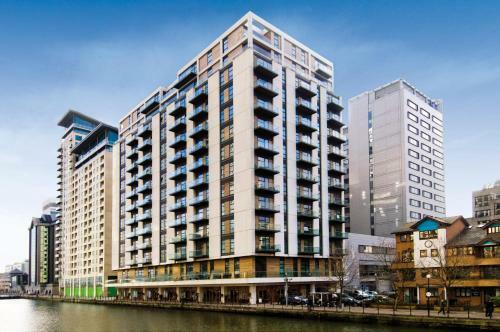 Apartment address: 3 South Quay Square, Discovery Dock, E14 9RU. Private parking is available at a location nearby (reservation is needed) and costs GBP 20 per day. 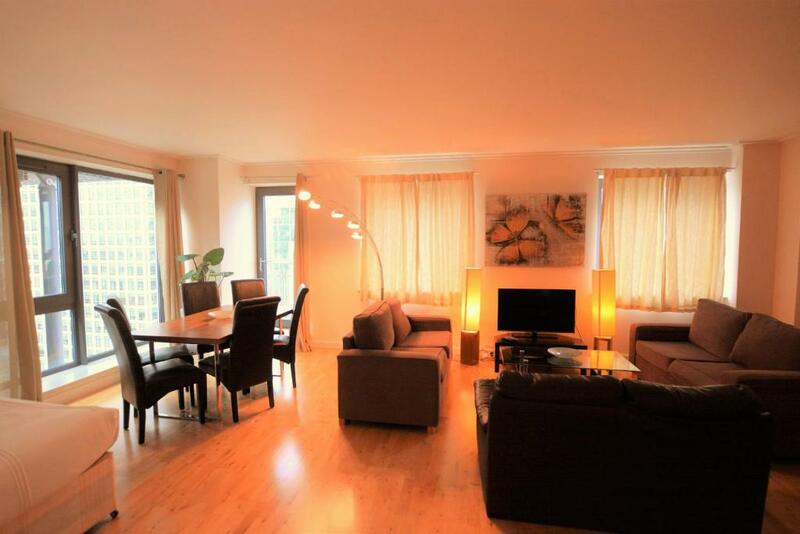 This spacious one double bedroom apartment in the heart of Canary Wharf features a living room, a kitchen with all the facilities, free WiFi and flat-screen TV. South Quay DLR Station is just a 2-minute walk away and Canary Wharf Underground Station is a 5-minute walk away. 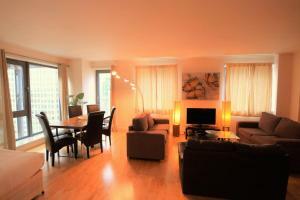 Easy access to Central London, Stratford and O2 Arena by public transport. This luxury apartment has contemporary décor, a spacious lounge with a flat-screen TV and a sofa, 2 bedrooms and bathroom. The kitchen comes with a microwave, fridge, oven, washing machine and a dishwasher. Free WiFi is included. 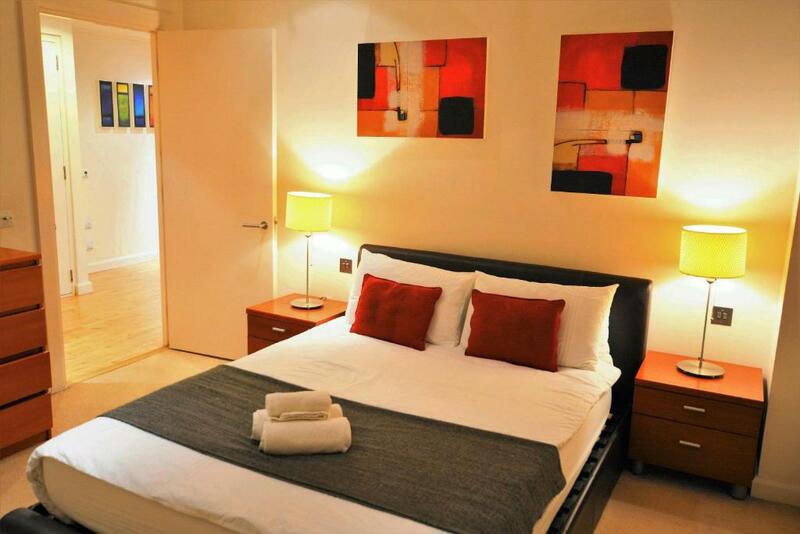 It is located just few minutes walking from South Quay DLR station and Canary Wharf Underground station. All bars, shops, restaurants is just a short walking distance. Some apartments have a balcony with views of the docks. 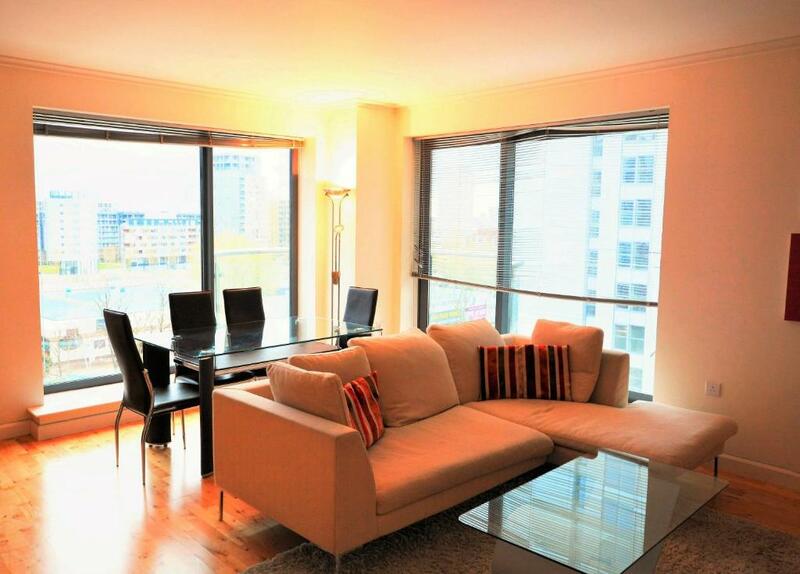 Apartment address: Discovery Dock West, 2 South Quay Square, Canary Wharf. 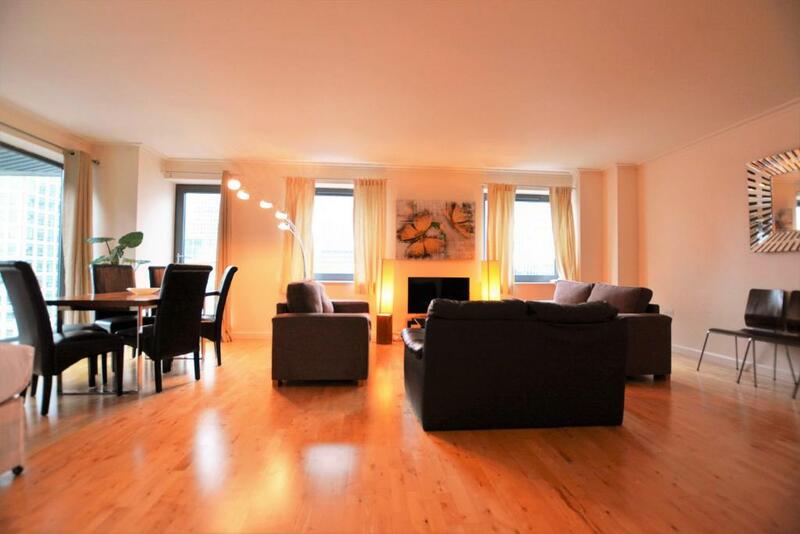 A spacious 2 bedroom apartment for a maximum of 6 guests. 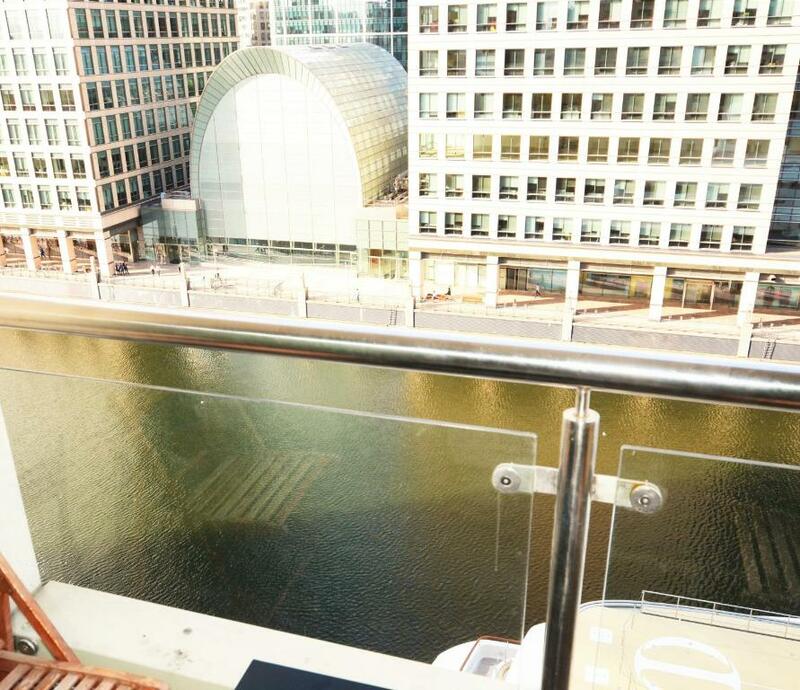 It has a balcony overlooking Canary Wharf. It also has a fully-equipped kitchen, a flat-screen TV and free WiFi. Each ZEN APARTMENT offers more space, freedom and comfort compared to the equivalent standard hotel room. We provide accommodation ideal for the business traveler, situated within a 5 minute walk of a London Underground. World's top BANKS and IT companies have European headquarters which are based in Canary Wharf, UK. Canary Wharf attracts over 50% of all business travellers in London. There is a great selection of shops, bars and restaurants close by as well as transport links connecting you to the rest of London. House Rules Zen Apartments- Canary Wharf takes special requests – add in the next step! A GBP200 damage deposit is required on arrival (around USD260.19). This deposit will be fully refunded 7 days after check-out, as long as there isn't any damage to the property. Zen Apartments- Canary Wharf accepts these cards and reserves the right to temporarily hold an amount prior to arrival. A security deposit between GBP 200 and GBP 2000 is required on arrival for incidentals. This deposit is fully refundable, subject to a damage inspection of the accommodations, 5 workings days after your departure. Upon check-in, guests must show a valid, government issued photo ID card and the credit card used for the booking. If the guest is not the cardholder then the cardholder must be present upon check-in to provide the card used to make payment and photo ID. Please note that the apartment accommodates adults only. Children cannot be accommodated. Zen Apartments operates a very strict no party, no gathering policy. Should the maximum number of people per apartment be exceeded without authorization, guests will be charged automatically. ZEN Apartments will send you an email after booking to take payment for your reservation. Please inform Zen Apartments- Canary Wharf of your expected arrival time in advance. You can use the Special Requests box when booking, or contact the property directly using the contact details in your confirmation. A damage deposit of GBP 200 is required on arrival. That's about 260.19USD. This will be collected by credit card. You should be reimbursed within 7 days of check-out. Your deposit will be refunded in full by credit card, subject to an inspection of the property. The flat was dirty and out dated. The lights were dodgy and the duvet covers and towels were yellowing. The host requested we paid a large deposit in the car park before we went into the flat which was extremely strange. He didn’t even show us to the flat just pointed us in a rough direction. The carpets were worn and the balcony was about a half meter square of rusty metal. The address we were emailed was to a completely different block of much nicer flats so when we called the company they texted us a new address and we had to walk further to meet elsewhere. The man who met us in a car park to give us the keys allowed us to have a slightly later check out which was good. However we were still disturbed several times in the morning by cleaners etc who hadn’t been given the message. The flat can be cold with few effective heat sources. The towels and bed linen were stained and need replacing. The oven didn't work. Batteries in the TV and satellite remotes need replacing. The host made a deposit up on the spot of a £1000 which makes no sense. He then narrowed it down to £500, I felt like if I was white and in a suit he would have charged me the £200 deposit as stated on the site. Shd have had better facilities and what is shown on the website is not what is seen or experienced at site. We got a call before we arrived informing us of 200 security deposit however as soon as we arrived we were told it was £1000 security deposit because “they have had our kind before and they used this apartment for a party” which had nothing to do with us. After a long winded discussion, we paid the deposit because if not we would be stranded. Now here comes the fun part. After payment of the security deposit, we were told, we could not have any guest and if we received any guest it would be a £1000 charge for each guest that we receive. I felt highly uncomfortable with the way we got treated. So again, don’t bother unless you are white person. it’s difficult to get the key. And before 10 am, a man came to open the door with his keys and hurried to check out. Fortunately, I hung the lock and he did not come in. Scared to death. Apartment was dirty. Bedsheets were stained. Towels were dirty. Bedroom carpet stained. Very noisy due to building works. Furniture - particularly sofa filthy. Apartment in poor condition which no amenities. Lamp was broken, inside toilet was blackened, all the pictures showed wooden floor but the apartment I was in was carpeted throughout and the carpet had several stains, one of the curtains wouldn’t open in the living room because the rail was broken blocking the door to the balcony, in the kitchen it clearly wasn’t cleaned well because I noticed toast had fallen between the fridge and the unit among with some other bits of food and left there. Honestly the apartment looked nothing like the photos. I was there just one night because needed a place to stay for a friend not living in London for a bday night out, so didn’t spend much time inside, otherwise I would have kicked up more of a fuss. Was told it would be 5 days to receive my deposit back yet still waiting. The one redeeming fact was that I had lost the original card that I had paid with and the lady who met me figured out a work around. She seemed quite friendly. Couldn’t work heating or hot water properly. Couldn’t stop fire alarm beeping except via fuse box. No toilterires of note in bathroom. Bath Towels too small. With hindsight would have stayed at local hotel at similar price point. Cleanliness of apartment and view across Canary Wharf. The noise from the construction work next door. The bed a bit too soft. The apartment was not particularly clean. There was a used condom on the floor under the bed which was disgusting. I pointed this out to the cleaner when I left. The O2 network was down all day on day of arrival which the host was not aware of it made communications with the host very difficult.